If you require cost effective, reliable heating and plumbing engineers then look no further. Operating throughout Stockton-on-Tees, Thornaby, Billingham, Eaglescliffe and the surrounding areas we cater to all domestic and business client's central heating systems, gas services and plumbing requirements. I started installing central heating systems 10 years ago for British Gas and then later started my own company. We are friendly local engineers who take pride in our work as it shows that 100% of our work is produced for the private consumer. We fit gas, oil, solar, heat pumps and biomass boilers all to a high quality non rushed install. We fit the best equipment at the best prices and adopt a right first time approach to our work. 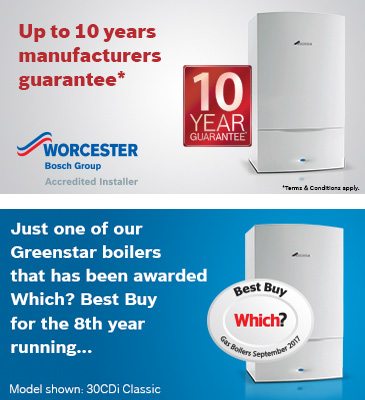 Worcester Accredited installers are - Recognised domestic and commercial heating companies that meet, or exceed the standards of sustained quality of installation, service, and customer care. Worcester Bosch ensure our clients receive a high standard of workmanship, and professionalism, our accredited companies are monitored by several recognised trade and industry bodies. Tom Leonard Heating Services takes gas safety seriously. All of our engineers are on the Gas Safe Register and will have their official identity card when you ask to see it. Responded very quickly to boiler fault. Discussed options and agreed replacement boiler was the way forward. Arranged to come within 3 days. Arrived on time and completed work quickly and efficiently. John and Tom fitted a new Worcester boiler, with new valves to all our radiators. A truly professional and efficient job, with no mess left behind. Two extremely helpful and friendly guys, who explained the controls perfectly in simple terms. Well recommended! Mr Leonard located the problem we had within our heating pipework system and corrected it with professional efficiency, and I recommend his company without reservation.